One of the great intellectual legacies of what some have referred to as the “golden age” of LSE is a series of public lectures dedicated to the memory of Ralph Miliband – one of the most distinguished professors at LSE. Ralph Miliband arrived here in Britain in 1940, escaping certain death in Nazi-occupied Belgium. After service in the navy during World War II, he went on to study here at LSE under the equally famous Harold Laski. One of the true giants of LSE, Laski had arrived at the School from the United States in 1920 – his position having become untenable at Harvard because of his political views – and continued lecturing here until his sudden and early death in 1950. Strongly supported by Laski, Miliband was appointed to a position and taught at LSE for the better part of twenty years. It was at the School that Ralph published his two well-known Marxist classics: Parliamentary Socialism (1961) and The State in Capitalist Society (1969). At times, both had a very rocky relationship with the School. As Mike Newman shows in his biography, so alienated did Ralph become by the late 1960s that he finally decided to leave. But like Laski before him he had made his mark. Both contributed to LSE’s reputation for over 50 years for being a rather radical place. Their impact was felt through their writings, and maybe even more significantly through their extraordinarily well attended lectures. Were Harold Laski and Ralph representative? Or were they tolerated by a liberal and sometimes not-so-liberal establishment, at a School which was just as famous for appointing Friedrich Hayek in the early 1930s and Karl Popper in the late 1940s? Hayek wrote The Road to Serfdom in 1944 and Popper made his reputation by writing The Poverty of Historicism and The Open Society and its Enemies, both complex works displaying great erudition, but which I remember being given to read in the 1960s as an antidote to Marx and Marxism. When Laski suddenly died in 1950 he was not replaced by a radical but by Michael Oakeshott – much to the consternation of Laski’s old students not to mention the left-wing magazine New Statesman. When Ralph left for Leeds in the early 1970s, the School seemed to be in no hurry to replace him with someone of similar theoretical disposition, or – I might add – of equal intellectual stature. Is there even a story to be told about that supposed red flag flying or more precisely “fluttering” over Houghton Street? Some would say most definitely not. One who has made this palpably clear in the strongest possible way was Paul Hoch, an American radicals who made his name during LSE’s Troubles in the 1960s. In his own short book, ironically titled, Academic Freedom in Action (1970), Hoch set about the history of the School and what he termed the “bourgeois content” of the social sciences it taught. If one were looking for further “proof” of the solidly establishment-like character of the School one might also examine the careers of the LSE Directors who have led the School since it first opened its doors in 1895. The first, W A S Hewins, was not an orthodox economist or a free trader. But he was a supporter of protectionism within the British Empire. Much later he wrote a defence of imperial preference and empire under the extraordinarily honest title of The Apologia of An Imperialist (1929). The second Director, the world-famous geographer Halford Mackinder, was an imperialist too, albeit a most interesting thinker in his own right whose writings on geopolitics are still read today. Clearly no socialist he. Nor was the fourth Director, William Beveridge who led the School so successfully between 1919 and 1937. He was in turn followed by Alexander Carr Saunders, a distinguished demographer who dabbled in eugenics but who could hardly be described as radical. Nor could his successor Sydney Caine, a civil servant who had decidedly positive views about the market, or his successor Walter Adams. Ralf Dahrendorf was the first German and the first sociologist to direct the School. In his early days a social democrat and a man who knew his Marx, Ralf had by the 1950s become solidly liberal. Indeed, he later described himself as a Popperian. Dahrendorf was followed by the distinguished Indian academic and banker, I G Patel. Patel was in turn followed by a scientist who was never really at home in the School, who was later followed by a very clever and able man, but no socialist he: Howard Davies. I have left out two Directors along the way who could hardly be described as being Popperians or Hayekians. William Pember Reeves (the third Director) was the standalone Fabian appointment in the School’s long history. Apart from having a radical suffragette wife (Maud Reeves) and an even more radical daughter (Amber Reeves) Reeves himself was no great radical. Then of course there was Tony Giddens, the most influential social theorist of his generation and a dynamic Director as well. Tony would be the first to admit, his intellectual project (as opposed to his role as Director) was not to reboot radicalism but rethink the whole socialist project, which he did under the heading of the “Third Way”. Left-wing critics of the School would say this proves their point: LSE has always been a rather respectable institution – with a dash of red here and there. Why has the place acquired the reputation it has? Is it purely fictional? Is it only based on the appointment of just a few academics like Laski and Milliband? The School has for a variety of reasons been perceived as being very different to what might be described as a “normal” university. Perhaps it is a question of perception rather than facts, but the two cannot be entirely separated. Indeed, perceptions are themselves forms of facts. In fact, the red label which attached itself to the School – almost from day one – was one that its Directors and governors found to be decidedly embarrassing. There are several examples of this. One is provided in the 1930s when it looked like the library of the Marxist Frankfurt School might be relocated here. Why LSE you might ask? Well in the end it wasn’t because of a decisive intervention by Lionel Robbins, one of the very big beasts of the School and perhaps its most influential figure. He made it clear to the Director Beveridge (who agreed) that the School already had a reputation for being left-wing and socialist and that if it were to accept the donation from Frankfurt this would make life even more difficult in terms of its reputation. There is another great example I have found in 1940. All aliens in this country – even anti-Nazi ones – were viewed as potential fifth columnists; the enemy within. And many were interned. But before this could happen there was always a tribunal and one of these was held in Hampstead in North London. Before the judge appeared the famous German demographer R R Kuczyinski. Kuczynski made his case and all seemed to be going well – until he decided to mention the fact that he worked at LSE. This was in an attempt to prove that he was an upstanding member of society. The judge bristled and looked Kuczynski in the eye and said in a meaningful and menacing way, “I know all about the LSE Mr Kucyzinski”. So too it seems did Sir Frank Harris, the commander of British Bomber Command in World War II. LSE Professor Charles Webster and another writer, Nobel Frankland, had been given the job of writing the official history of Bomber Command. Webster met and tried to convince Harris of his academic intentions. Harris was having none of it. Not only was Webster – an immensely respected diplomatic historian – critical of Bomber Command. Worse still, according to the conservative Harris, he worked at a communist institution dedicated to the destruction of the British Empire. Harris never wrote a puff for the book. Harris’s attack on LSE as being an enemy of power was later taken up by yet another significant figure – an American who saw what he believed was the influence of the School in the Third World during the 1960s and 1970s. As one country after another achieved independence and began to experiment with economic policies not in tune with western interests, a number of observers began to look for the sources of this non-conformity and found it in the teachings of people like Laski and Miliband at LSE. Daniel Patrick Moynihan thought he knew of what he spoke, for he had studied at LSE in the 1950s. Born in poverty and a life-long Democrat, he later went on to write a number of controversial studies on American society, and then worked for Nixon. Finally, he took on the challenging job of being US Ambassador to India, then a permanent representative at the UN. Here he met the rising tide of radical Third Worldism directed very much against the US and its close ally Israel. But who or what was to blame for all this, he asked in an article published in 1975 in the magazine, Commentary? LSE, with what he saw as its strong anti-capitalist bias, and the kind of British socialism propagated at the School, was causing the US so much trouble around the world. In spite of what revolutionary sceptics like Hoch might think about the “bourgeois character” of LSE, others like that judge in Hampstead, Harris and Moynihan were to take a very different view. But where did this come from? Why? A number of factors are at play here. One has to do with memory and what LSE is still remembered for. One thing that comes up time and again is what happened here in the 1960s. There is much misunderstanding about this. Most of the staff were not on the radical students’ side. Some even got the sack, including Robin Blackburn and Nicholas Bateson, while the Walter Adams appointment which precipitated the troubles in 1966-1967 stood and the establishment won. But the reputation was there long before the 1960s. Lionel Robbins for one was deeply worried about it in the 1930s. So too in fact was Sidney Webb – the key founder of LSE along with Beatrice, G B Shaw and Graham Wallas back in 1895. Time and again Sidney went out of his way to prove the School’s innocence of the charge laid against it of propagating socialism. You can certainly see this in some of his early appointments. Indeed, a few of these seriously upset G B Shaw. They also rankled with the radical anti-imperialist John Hobson who was never offered a post at the School and later commented that while people like Hobhouse and Wallas kept alive the “broad humanism” of LSE, others did not – notably the economists Professor Foxwell and Ackworth: the first he noted taught his students why not to “socialise banking”, while the latter lectured on why not to “nationalise the railways”. He continued that Henry Hutchinson who had made that famous £10,000 donation in 1894 would have “turned his grave”. This though brings us perhaps to the nub of the matter. 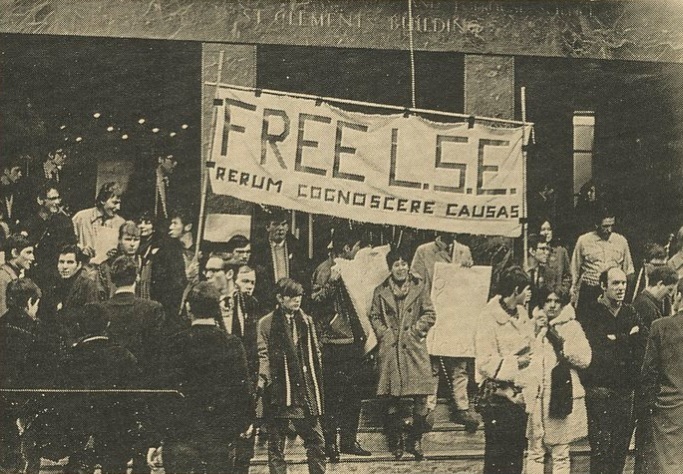 For while Sidney may have protested LSE was not a “party school”, the very fact that the School was created by four Fabian socialists left its mark and shaped its reputation for decades to follow. It would have been easier if both Sidney and Beatrice had done what many socialists have done – that is renounce their earlier views as expressions of youthful naivete. But they did not. On the contrary they moved leftwards with the times. Thus in 1918 Sidney wrote the Labour Party Constitution. In 1923 he and Beatrice wrote about The Decay of Capitalist Civilisation and by the 1930s in the midst of the world depression they espoused the cause of the USSR. Later the Soviet Ambassador Ivan Maisky wrote about Beatrice as if she were a comrade in arms. This in turn raises another issue – who then taught at the School and the students themselves. There is no easy generalisation one can make about either. Still, one can readily see why LSE acquired the critical reputation it did. Look at some of those who helped shaped part (though again not all) of the intellectual agenda here for many years: R H Tawney; Eileen Power; Kingsley Martin; Clement Attlee; Hugh Dalton; Evan Durbin; Nicholas Kaldor; the Webbs themselves; and of course Laski. Even those who were not identifiably on the left – like the anthropologist Bronislaw Malinowski – attracted many students who were. Finally, if we think of the School less in terms of its Directors and governors and more in terms of its students it is easy to see why the School may have developed a reputation – and long before the 1960s came along. Many were interested in changing the world – especially those who came from Asia and Africa or the West Indies (even the USA). Here Moynihan was not completely off target. The list is impressive and includes many who discussed how to bring about independence in their own countries. I’ve always felt that the combination of LSE and Lenin was a very powerful one – it’s a dialectical combination. In some respects they were at war with another but was a creative war between two methodologies. The Leninist is the activist methodology [he goes on]: the LSE methodology is going out into the field and discovering reality through direct contact with it. The world has changed as a result of the collapse of the Soviet experiment and the spread of capitalism. As Tony Giddens noted, long before he became LSE Director, there was only one way forward by the 1990s and that was to accept that the world was a very different place to what it had been in 1895 or 1917 or 1945 or even 1968. If anybody’s ideas had triumphed it was not those espoused by Laski, Clement Attlee, Evan Durbin or Ralph Miliband, but those liberal economic ideas defended by Robbins and Hayek. This was the true revenge of history. A defeat for those who had once flown the red flag over Houghton Street. All I have tried to do in this very modest paper is try to remind people of one very important part of LSE’s history – a history that today can too easily be brushed under the carpet by those who either find it embarrassing or just beside the point. We can’t relive the past. Nor can we repeat it. But what we can do is draw creatively from it, to think critically about the world. To paraphrase one very well-known social scientist who died in 1883, our role as intellectuals is not just to interpret the world or find out the causes of things, but through our endeavours make the world a more humane place. One can only hope that the modern LSE continues to draw inspiration from its critical past. In our disturbed and dangerous times this legacy – which could so easily be forgotten – has possibly never been as relevant. This paper was first presented in the Ralph Miliband Lecture Programme, Thursday 19 November 2015 and later expanded and presented at the International Workshop. ‘Global Elite Knowledge Networks and Anglo-American Power: Think Tanks, Foundations and Universities and the New World Order, 1940-1990’. Visit LSE 1969, 18 February-15 March, a free exhibition in the Atrium Gallery.